This one semester introductory course is the first step in an exploration of this fascinating career. It will offer students an introduction to a career behind the counter in a pharmacy and the wide variety of opportunities that are sure to follow. Students will learn the history of the field of pharmacy work and pharmacology. The course will emphasize appropriate medical terminology, anatomy and physiology, math as related to filling prescriptions, and drugs as related to body systems. Lots of hands-on training and exciting activities will get you closer to your goal of becoming a PHARMACY TECHNICIAN. Course is open to high school and adult students. If an adult, student must provide proof of a HIGH SCHOOL DIPLOMA or GED (translated into English). 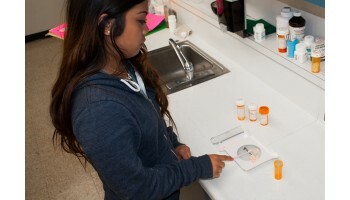 This course is a prerequisite for Pharmacy Technician for high school students. High school students must have a â€œCâ€ or better in Math and Science. Maria F. has successfully found employment as a Customer Service after completing course(s) in Medical Front Office. Paulina R. has successfully found employment as a Production Intern after completing course(s) in 3D Character Design and Animation.